"When you are told that you can not eat a food it is when you want it most, this in the case of children it multiplied because they want to eat the same as everyone else. What's more, if what they can't even try is a dish as successful as the pizza it is a real nuisance. Thinking of everyone, the Lapizza+sana restaurant offers a very personal selection of pizzas also suitable for celiacs, gluten sensitive or lactose intolerant people. Start sharing the nachos with some of their special cheeses, choose from a wide variety of salads and do your head in deciding which of their succulent pizzas you prefer. All of them are made with natural ingredients of the best quality! If in doubt, don't miss the Pizza Marroquí with chicken and honey; or the Mediterranean with eggplant, authentic beef loin, onion and garlic. All are available with thin pizza bases of four types: normal wheat, organic wholegrain, gluten-free and lactose-free. And their desserts are also suitable. If the weather is nice enjoy them on the terrace and, later, finish your day of pizza solidarity with a good ride on the free bikes offered in the nearby Juan Carlos I park." De Lunes a Viernes no se ofrece el menú del día con reserva previa. Car park Facilidad de aparcamiento sin zona de pago. 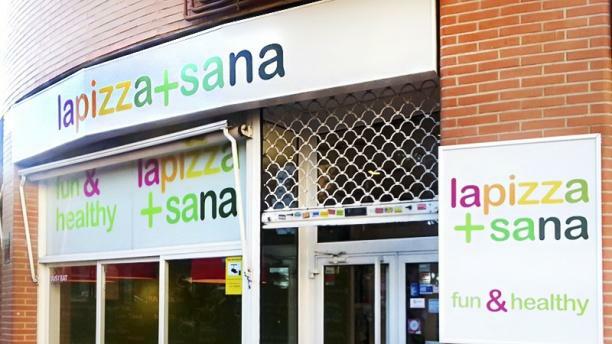 Imprescindible para una buena pizza en la capi! De 10! Está buenísima la pizza!!! Ñumi ñumi :-) volveremos seguro!